Home » Service Manual Catalog » EPSON Service Manuals » InkJet Printers » SM_SCF7200 I have paid for Reset Key but not received yet. Epson SC-F7000, SC-F7100, SC-F7200, SC-B7000 printers Service Manual and Connector Diagram New! If you've replaced the heads, or removed/re-installed them, you need this! Also does a power nozzle clean - worth the money just for that. Note it needs DOS or a DOS box in Windows. 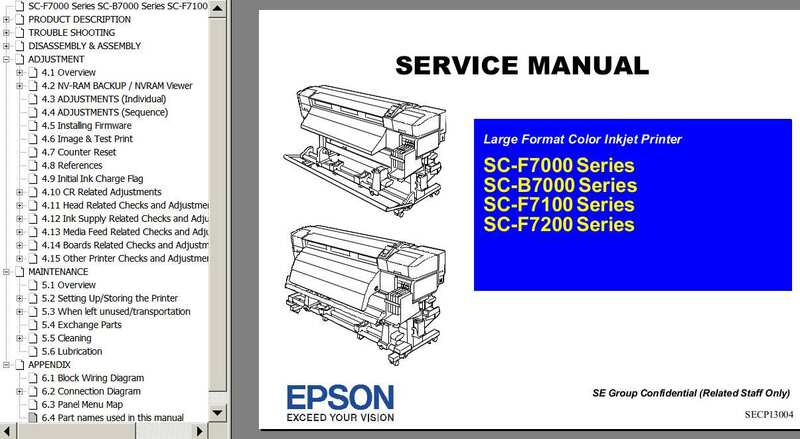 Notify me of updates to Epson SC-F7000, SC-F7100, SC-F7200, SC-B7000 printers Service Manual and Connector Diagram New!